UPDATE: Dallas signs Hardy to 1 year, 11.3 million deal, worth up to 13 million, per Pro Football Talk. 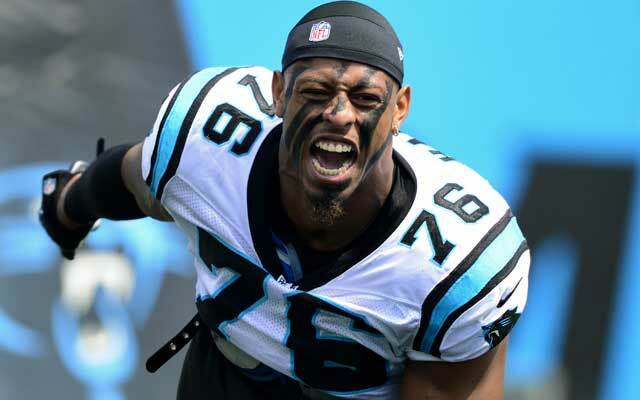 The most talented player remaining in free agency, Greg Hardy, is down to two teams, per Drew Rosenhaus. With that in mind, let’s discuss his potential fit with both franchises. Dallas Cowboys: Under Rod Marinelli last season, the Cowboys lacked even a shadow of a consistent pass rush. While Marinelli was able to coax the best out of role players like Jeremy Mincey and Tyrone Crawford, an injection of proven talent could be just what the doctor ordered to kick-start this middling defense.Hardy figures to slide right in opposite run-stuffing defensive end Crawford while Mincey rotates with Hardy. Imagine a set where they overload with Mincey on one side and Hardy and Lawrence on the other, that could be a force on third and long. Tampa Bay Buccaneers: With Lovie Smith in the building, the Bears transitioned to his cover 2, which is similar to a Tampa 2 in many ways. You have to believe the Bucs want some more return from their pass rush with their top sack total coming from elite DT Gerald McCoy. The next best was promising young DE Jacquies Smith, but he only had 6.5 sacks and he only covers one side. The departure of Adrian Clayborn, Michael Johnson and DaQuan Bowers from the lineup leaves a gaping hole opposite Smith. The current starter is first-round bust Larry English, they need help. Hardy can slide right in as a heavy part of the rotation, English can be a compliment as a pass-rush specialist but should not start for any team. With Hardy, the Bucs also gain veteran leadership for what is a very young and generally inexperienced defensive end corps. Prediction time: While the Bucs could certainly use his services and will probably be willing to pay him a good amount, I expect Hardy to try to revive his career with an excellent defensive coordinator and a stronger team overall in Dallas. Expect 1, maybe 2 years for Hardy. Top end of the contract, maybe 4 million per year. Remember, Hardy is still on the exempt list. Thoughts on Hardy? His fit? Whether he should even still be in the league? Drop your slant below. Update: According to Jason Licht, GM of the Bucs, they will no longer be pursuing Hardy. “At the end of the day, we didn’t feel good about it,” Licht said.